This guy is in a nest close to the town of petrolia Ontario. I'm wondering what breed he is??? 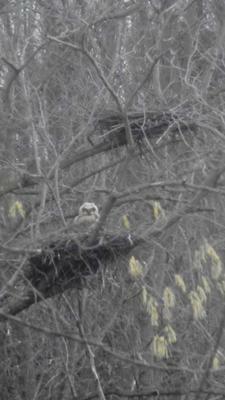 Thanks for sending us this picture Wayne, perhaps one of our readers will be able to identify this Owl. Looks like a Great Horned Owlet to me. I am in Forest and have only had the chance to see Snowy Owls this winter. Where in Petrolia was this spotted if you don't mind me asking?